When life's circumstances breed new technology, great things happen. The LapDawg X4 is a good example. If you use your laptop to get your email in bed, browse the Internet from the chaise longe, or work in non-office environments, the LapDawg X4 is for you! 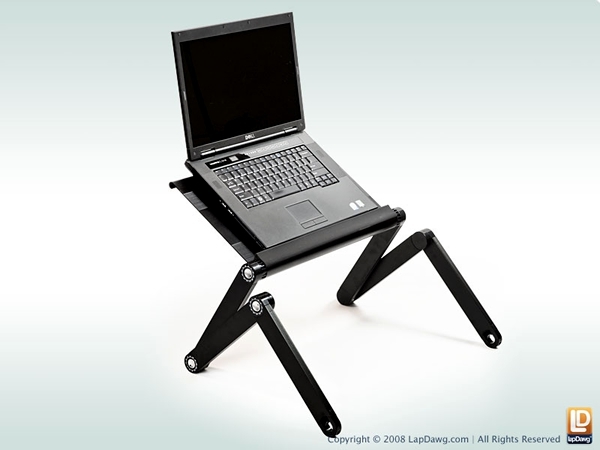 Or, if you are just looking for the ultimate in ergonomic adaptability, you need to read on.Born from an accident causing temporary immobility, the LapDawg X4 is a highly unique laptop stand that can adapt to almost any setting or topography. Mostly built of extruded aluminum, the LapDawg X4 is light (at roughly 5 pounds) and feels durable. The stand adjusts from ground level to up-to 20 inches when configured like a desk. For ease of use, large pushbuttons allow you to adjust six arms individually in 360 degrees of rotation. Graduated tick marks guide you to precise and consistent angles. Once you find a comfortable angle, you will always be able to replicate that comfort. Likewise, the ability to adjust the arms individually allows you to fit the stand to settings that aren't conforming. This becomes very handy in bed, or on the couch, where cushioning prevents level surfaces. 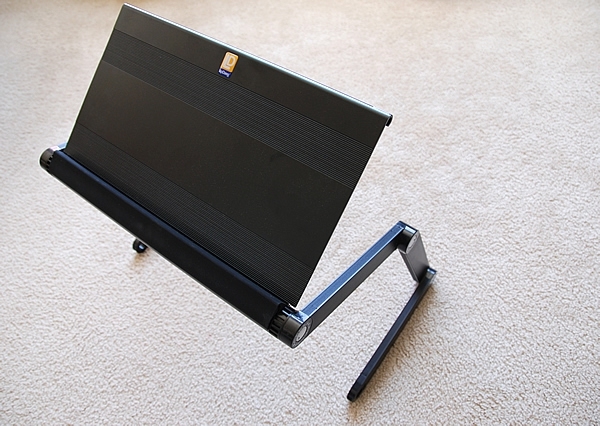 Figure 1: The LapDawg X4 not only raises your laptop, but also raises the bar for laptop stands. In practice, the LapDawg X4 performs as promised. I used it in my living room, on my couch, and found the stand quite useful. I adjusted the individual arms in different directions and angles until a stable base was created. Once there, I adjusted the angle of the shelf to accommodate a comfortable and ergonomic typing environment. Perhaps more importantly, the stand lifted both the weight and heat from my lap. I also found that I could move my legs without disturbing the laptop or changing my typing position. It made so much sense I found myself wondering why someone hadn't thought of this before? Figure 2: A high degree of adjustability. The adjustment buttons provided audible and solid, secure-feeling clicks once locked into place. But take caution when adjusting these settings with your PC on the shelf. I held the shelf and my PC while making the adjustments, and this caused my heart to pause for fractions of a second every time I made a change. 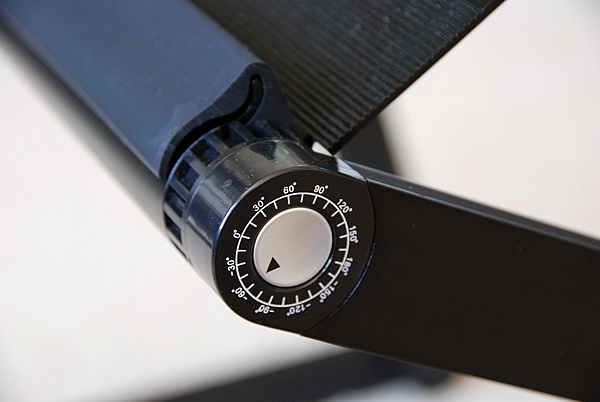 When you press the buttons in to make an adjustment to the shelf, the shelf glides frictionless up and down. If you are not careful, this can send your laptop shooting toward utter doom. My advice? Do not adjust the shelf with your PC on it. I found it best to set the laptop to my side, make the adjustments, and then finally set it on the shelf. Additionally, choose your angles carefully! The laws of physics inform us that weight suspended at heights quickly become top-heavy and prone to finding the quickest path possible to the hardest surface. I found my confidence in the unit's abilities tended to cloud my judgement when moving to new settings or sitting environments, and this lead to precarious situations. The moral of the story is take caution when adjusting the stand to your preferred position, as well as, when moving or relocating to a new environment. Properly done, the LapDawg X4 does its thing with trust, elegance and poise. Pros: It's easy to use, light and portable, stable and comfortable, and infinitely adjustable. Cons: It easily becomes top heavy, can be awkward and time consuming to adjust six arms and a shelf individually, is inconvenient to precisely adjust (as the graduated tick marks are on the outside of each arm - and out of sight), and can't be adjusted with your PC on the shelf. Eric Juillerat is a technologist, geek, and all around admirer of anything with silicon, buttons, or touch screens!